In 2003, the house at 6 Oakwood Lane, Leeds was emptied. It contained literally a ton of memorabilia. Three generations of wrestling had lived at Oakwood Lane. The Yorkshire Evening Post reported that Darren Ward, historian of the sport, had bought a second terrace house in Rothwell just to store it. Born in Kensington 1887; his father was Russian and came to Britain via Switzerland. He moved to Oakwood in 1936/7 presumably for its central location. He had started the Pro Wrestling shows as we know them today in 1933, covering an area from London to Scotland and Fleetwood to Hull. He started wrestling as a means of keeping fit whilst studying . By age 20 he had won 35 successive bouts and was English amateur champion in two weight classes, Lightweight and Middleweight, in 1907 and again in 1908. 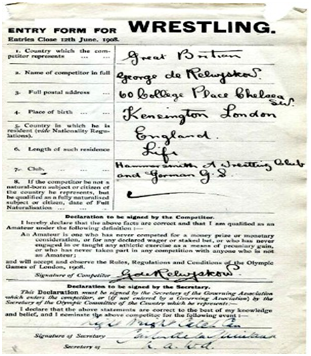 In 1908 he was selected to represent Great Britain in the Olympic Games, held at White City. After winning a gold in the lightweight class he went on to compete in the middleweight division against opponents, not only heavier but far more experienced. One outweighed him by a stone (6.6 kilos) George was awarded a silver. He was the only wrestler to hold medals in two weight classes. He won both in the same day. He was also the youngest to win a gold medal for wrestling. This held for 70 years. 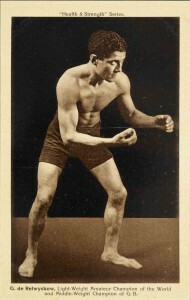 In 1909 he beat Frank Gotz in Pontefract in a bout lasting one hour to become lightweight champion of the world. After winning the Olympic gold he toured all over Great Britain. 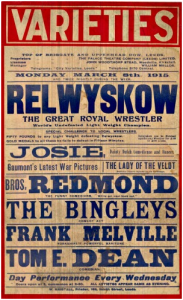 At that time professional wrestling was promoted as a variety act in theatres and music halls, such as the City Varieties in Leeds. George was always top of the bill, offering fifty pounds to anyone who could pin his shoulders to the mat. Apparently he never had to pay. He also made a tour of South America but returned in 1914 to enlist in the army as an unarmed combat instructor where he was promoted to sergeant-major, was posted to Australia and later to France to train instructors. In 1918 he was stationed at Aldershot and taught wrestling – his own style – to the army. He enlisted again at the start of World War II and served as an Instructor in Unarmed Combat and Silent Killing with the Special Operations Executive (SOE). After serving for a period as an Instructor to the SOE School in Canada – the Special Training School (STS) 103 (which was also known as “Camp X”),but felt that he was too old. He raised more than £7000 for charities during the war mainly from organising wrestling tournaments. 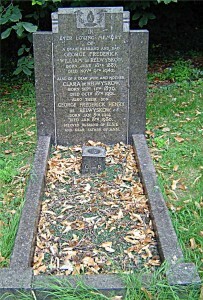 George died in Leeds at the Oakwood Lane address in 1942. (and not in Burma in 1943 as had previously been reported). He left a wife, Clara and two sons, George and Douglas. George Jr, was known to every fan of television wrestling as one half of Relwyskow and Green Promotions. He was an outstanding wrestler in a short lived 1930s career. An injury whilst serving during the second world war brought this to an early end. Ironically, the injuries that prevented a post-war career may, for wrestling fans, have been for the best because following the war George and brother Doug (later a referee) turned to promotion. It is for his contribution as a promoter, in which he formed a business partnership with Arthur Green, that George de Relwyskow is most often remembered. In 1947 Admiral Lord Mountevans, a fan of the sport, was prompted to create a committee to produce official rules. The style at the time was unique, with the strong emphasis on clean technical wrestling. Promoters readily acknowledged the committee and in 1952 four (later six) of them formed an alliance under the name of Joint Promotions. One of these was Relwyskow and Green of Oakwood Lane, Leeds. Their principle activity was promotion throughout the United Kingdom. Every town of note had a show at least once a month, and more than 30 cities had a weekly date. By the mid–1960s, Joint Promotions had doubled their live event schedule to somewhere in the region of 4,500 shows a year. Leeds was involved from the outset and Oakwood in particular. From 1969 to the early 1980s live bouts were moved from the Town Hall to the (now demolished) Astoria Ballroom at the intersection of Gledhow Valley and Roundhay Roads. There was a wrestling gym over what is now Rico’s Italian restaurant in the 1960s and the Gipton (now Roundhay) Hotel was a regular Sunday lunchtime social venue. However, it was the exposure of wrestling on television that proved the ultimate boost. 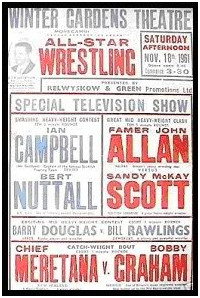 In its heyday wrestling attracted as many as 12 million viewers. At its peak an audience of 18 million tuned in. Kent Walton, instantly recognisable from his husky welcome at 4 o’clock each Saturday afternoon hosted the wrestling for all of the 33 years that it appeared. At the time of death secrets can be taken to the grave. It is for his contribution as a promoter that he is most often remembered. However, it transpired that, unknown to any of his friends and family, George had been a secret agent parachuted on numerous occasions behind enemy lines during the Second World War. It was a secret that had been well kept, even his wife, Elsie, only made the discovery as she went through his papers following the death. Just as his father had done in WW1, at the outbreak of war George signed up as a physical training instructor. He was shortly afterwards recruited by the Special Air Services and was seconded to a section known only by the name Room 98. It is believed that they were involved in the training of agents in preparation for planting in the occupied countries of Europe, amongst them Odette Sansom, the French born British spy awarded the George Cross. George trained agents in unarmed combat and parachuting and was one of the pioneers in using plastic explosives after parachuting into Libya. The injury which brought both this and any future wrestling career to an early end was caused by a land mine. It exploded under the jeep in which he was crossing enemy lines causing head and leg injuries. Douglas de Relwyskow was a TV referee. 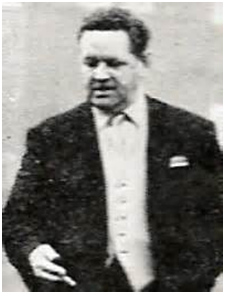 His great claim to fame was an appearance in a 1964 episode of Coronation Street, refereeing a match featuring Ian Campbell, himself an Oakwood resident who opened a butchers shop here on retirement. Douglas junior changed his name to Barry Douglas. Whilst aware and proud of his families heritage it did him no favours and was resented by some of his colleagues. He wanted to be judged on his own merits. Soon everyone acknowledged that Barry’s achievements were a result of his own talent and hard work, nothing else. Few others, if any, can match them. His was a career that spanned six decades and covered the length and breadth of the UK and much of the world, starting in 1959 and ending in the early years of the twenty-first century; and then he started refereeing!. Barry was known throughout the world, wrestling regularly in France, Belgium and Spain, becoming one of the biggest names in the huge German tournaments and one of the first to work in Japan. Barry certainly touched the hearts and minds of hundreds of thousands of wrestling fans and perhaps his greatest accolade is the high esteem in which colleagues hold him. Barry was undoubtedly one of British wrestling’s great ambassadors. The sport of wrestling goes back thousands of years. Evidence of its existence has been found on every continent, in every country, and every society. It is, without a doubt, the oldest sport known to man. Many believe that it is also the hardest. It goes by many different names in different countries with a whole spectrum of different rules, but it is, nevertheless, still wrestling. It is egalitarian, crossing social and intellectual boundaries: kings and presidents, peasants and singers, at country fairs and in national auditoria. 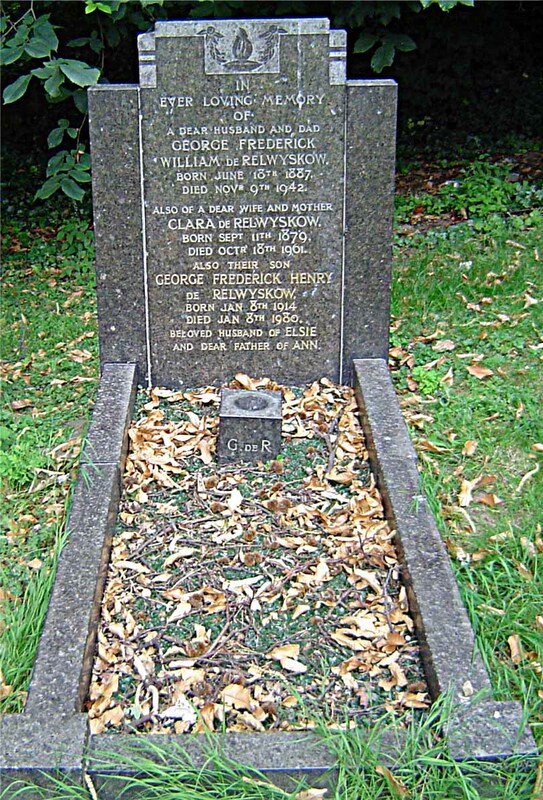 George Hackenschmidt was fluent in five languages, took a university degree very late in life and wrote three books on philosophy. This was besides being heavyweight champion of the world (and strongest man in the world). The1947 Mountevans Committee consisted of an Olympic gold medal champion; Mountevans himself, a British peer and an admiral; plus a member of the then radio Brains Trust and a Member of Parliament. One of the first casualties of Joint promotions was another English peer, Sir Atholl Oakley, himself a wrestler and then promoter of ‘All-In’ between the wars. The Queen (whose interest in the sport was mentioned in Richard Crossman’s diaries) was a fan as was the Queen Mother, whilst a 1968 event held at the Royal Albert Hall featured Prince Phillip, the Duke of Edinburgh, as a guest of honour. Televised wrestling ended in 1988. Joint Promotions was eclipsed partially by retirement but far more by the introduction of American Wrestling ( representing all that Mountevans had sought to avoid). Greg Dyke held that it could no longer be considered a sport. Kent Walton died in 2003 aged 86. One wrestler remarked that ‘everything has to change but it is not always for the better’. The de Relwyskow family memorial in St John’s graveyard. We are very grateful to Tony Pattison for putting together this summary of the lives of this remarkable family and their connection to Oakwood.